The audio for panels presented at Con of Thrones 2018 is being released to presenters! Since I was on six of them, it seems reasonable for me to share at least some of them here on my blog. From left to right: Matt, Ian, Percy, and this guy with an enormous forehead. 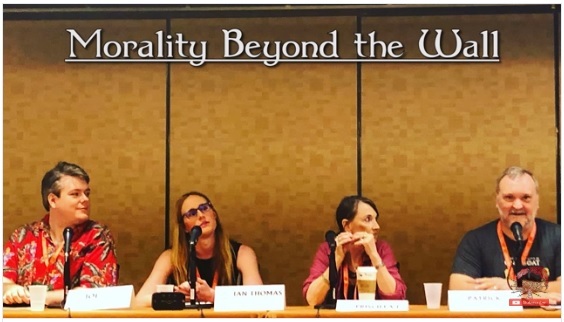 On Saturday at the convention, at 10 a.m., I was joined by Professor Priscilla “Percy” Walton, writer Ian Thomas Malone, and /r/asoiaf subreddit moderator Matt (aka Joe Magician) to discuss morality, or as Percy Walton described it – coded ethics – in the relatively uncivilized lands North of the Wall. It was an honor to present a panel with such learned and thoughtful people.